“I don’t have time. I don’t have time, and I thank God for this program. 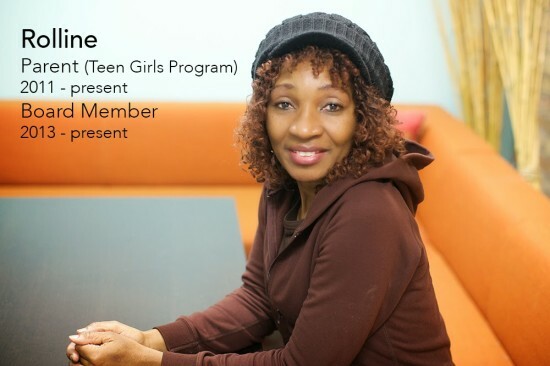 I work very far away, and Ashaki [the Teen Girls Director] supports me very much. Every year since my girls started coming to Family Matters in 2011, we have had new coats, new gloves. We had just left the shelter, and I couldn’t take my girls many places. Being a member of the board has been a good experience for me because I can talk with people of means. They are very humble, and they support this program, and I’m very proud of how much I’ve learned. I’m the kind of person who is open, and this has opened my mind too because I have learned how to talk, how to be a part of meetings. I have learned how to be a leader, how to talk with others, how to share my mind, how to deal with different kinds of people. “Family Matters has changed me in a lot of ways. I’ve learned many things – how to be a better person, a better worker, a better friend, and basically a better self. I wasn’t trying hard enough and Family Matters gave me that push to try harder. They inspired me to keep going and never give up. I’m very proud that I took the time to be here and hang out with the youth and the people my age as well. I’ve learned how to deal with a set of different people. We get a better understanding every time we come together. I am brought to tears reading the accounts from Rolline and Jerry. Family Matters is such a special community and I feel very blessed to have been a part of it as an intern last spring. I will always think about and pray for the girls and boys there. I miss you all and wish you the best New Year! !